Sciatica refers to pain or discomfort associated with the sciatic nerve. This nerve runs from the lower part of the spinal cord, down the back of the leg, to the foot. Injury to or pressure on the sciatic nerve can cause the characteristic pain of sciatica: a sharp or burning pain that radiates from the lower back or hip, possibly following the path of the sciatic nerve to the foot. The sciatic nerve is the largest and longest nerve in the body. About the thickness of a person's thumb, it spans from the lower back to the foot. The nerve originates in the lower part of the spinal cord, the so-called lumbar region. As it branches off from the spinal cord, it passes between the bony vertebrae (the component bones of the spine) and runs through the pelvic girdle, or hip bones. The nerve passes through the hip joint and continues down the back of the leg to the foot. Sciatica is a fairly common disorder and approximately 40% of the population experiences it at some point in their lives. However, only about 1% have coexisting sensory or motor deficits. Sciatic pain has several root causes and treatment may hinge upon the underlying problem. Of the identifiable causes of sciatic pain, lumbosacral radiculopathy and back strain are the most frequently suspected. The term lumbosacral refers to the lower part of the spine, and radiculopathy describes a problem with the spinal nerve roots that pass between the vertebrae and give rise to the sciatic nerve. This area between the vertebrae is cushioned with a disk of shockabsorbing tissue. If this disk shifts or is damaged through injury or disease, the spinal nerve root may be compressed by the shifted tissue or the vertebrae. This compression of the nerve roots sends a pain signal to the brain. Although the actual injury is to the nerve roots, the pain may be perceived as coming from anywhere along the sciatic nerve. The sciatic nerve can be compressed in other ways. Back strain may cause muscle spasms in the lower back, placing pressure on the sciatic nerve. In rare cases, infection, cancer, bone inflammation, or other diseases may be causing the pressure. More likely, but often overlooked, is the piriformis syndrome. As the sciatic nerve passes through the hip joint, it shares the space with several muscles. One of these muscles, the piriformis muscle, is closely associated with the sciatic nerve. In some people, the nerve actually runs through the muscle. If this muscle is injured or has a spasm, it places pressure on the sciatic nerve, in effect, compressing it. In many sciatica cases, the specific cause is never identified. About half of affected individuals recover from an episode within a month. Some cases can linger a few weeks longer and may require aggressive treatment. In some cases, the pain may return or potentially become chronic. Individuals with sciatica may experience some lower back pain, but the most common symptom is pain that radiates through one buttock and down the back of that leg. The most identified cause of the pain is compression or pressure on the sciatic nerve. The extent of the pain varies between individuals. Some people describe pain that centers in the area of the hip, and others perceive discomfort all the way to the foot. The quality of the pain also varies; it may be described as tingling, burning, prickly, aching, or stabbing. Onset of sciatica can be sudden, but it can also develop gradually. The pain may be intermittent or continuous, and certain activities, such as bending, coughing, sneezing, or sitting, may make the pain worse. Chronic pain may arise from more than just compression on the nerve. According to some pain researchers, physical damage to a nerve is only half of the equation. A developing theory proposes that some nerve injuries result in a release of neurotransmitters and immune system chemicals that enhance and sustain a pain message. Even after the injury has healed, or the damage has been repaired, the pain continues. Control of this abnormal type of pain is difficult. Before treating sciatic pain, as much information as possible is collected. The individual is asked to recount the location and nature of the pain, how long it has continued, and any accidents or unusual activities prior to its onset. This information provides clues that may point to back strain or injury to a specific location. Back pain from disk disease, piriformis syndrome, and back strain must be differentiated from more serious conditions such as cancer or infection. Lumbar stenosis, an overgrowth of the covering layers of the vertebrae that narrows the spinal canal, must also be considered. The possibility that a difference in leg lengths is causing the pain should be evaluated; the problem can be easily be treated with a foot orthotic or built-up shoe. Often, a straight-leg-raising test is done, in which the person lies face upward and the health-care provider raises the affected leg to various heights. This test pinpoints the location of the pain and may reveal whether it is caused by a disk problem. Other tests, such as having the individual rotate the hip joint, assess the hip muscles. Any pain caused by these movements may provide information about involvement of the piriformis muscle, and piriformis weakness is tested with additional leg-strength maneuvers. Further tests may be done depending on the results of the physical examination and initial pain treatment. Such tests might include magnetic resonance imaging (MRI) and computed tomography scans (CT scans). Other tests examine the conduction of electricity through nerve tissues, and include studies of the electrical activity generated as muscles contract (electromyography), nerve conduction velocity, and evoked potential testing. A more invasive test involves injecting a contrast substance into the space between the vertebrae and making x-ray images of the spinal cord (myelography), but this procedure is usually done only if surgery is being considered. All of these tests can reveal problems with the vertebrae, the disk, or the nerve itself. Initial treatment for sciatica focuses on pain relief. For acute or very painful flare-ups, bed rest is advised for up to a week in conjunction with medication for the pain. Pain medication includes acetaminophen, nonsteroidal anti-inflammatory drugs (NSAIDs), such as aspirin, or muscle relaxants. If the pain is unremitting, opioids may be prescribed for short-term use or a local anesthetic will be injected directly into the lower back. Massage and heat application may be suggested as adjuncts. If the pain is chronic, different pain relief medications are used to avoid long-term dosing of NSAIDs, muscle relaxants, and opioids. Antidepressant drugs, which have been shown to be effective in treating pain, may be prescribed alongside short-term use of muscle relaxants or NSAIDs. Local anesthetic injections or epidural steroids are used in selected cases. As the pain allows, physical therapy is introduced into the treatment regime. Stretching exercises that focus on the lower back, buttock, and hamstring muscles are suggested. The exercises also include finding comfortable, pain-reducing positions. Corsets and braces may be useful in some cases, but evidence for their general effectiveness is lacking. However, they may be helpful to prevent exacerbations related to certain activities. With less pain and the success of early therapy, the individual is encouraged to follow a long-term program to maintain a healthy back and prevent re-injury. A physical therapist may suggest exercises and regular activity, such as water exercise or walking. Patients are instructed in proper body mechanics to minimize symptoms during light lifting or other activities. If the pain is chronic and conservative treatment fails, surgery to repair a herniated disk or cut out part or all of the piriformis muscle may be suggested, particularly if there is neurologic evidence of nerve or nerve-root damage. Massage is a recommended form of therapy, especially if the sciatic pain arises from muscle spasm. Symptoms may also be relieved by icing the painful area as soon as the pain occurs. Ice should be left on the area for 30-60 minutes several times a day. After 2-3 days, a hot water bottle or heating pad can replace the ice. Chiropractic or osteopathy may offer possible solutions for relieving pressure on the sciatic nerve and the accompanying pain. Acupuncture and biofeedback may also be useful as pain control methods. Body work, such as the Alexander technique, can assist an individual in improving posture and preventing further episodes of sciatic pain. Most cases of sciatica are treatable with pain medication and physical therapy. After 4-6 weeks of treatment, an individual should be able to resume normal activities. Some sources of sciatica are not preventable, such as disk degeneration, back strain due to pregnancy, or accidental falls. Other sources of back strain, such as poor posture, overexertion, being overweight, or wearing high heels, can be corrected or avoided. Cigarette smoking may also predispose people to pain, and should be discontinued. General suggestions for avoiding sciatica, or preventing a repeat episode, include sleeping on a firm mattress, using chairs with firm back support, and sitting with both feet flat on the floor. Habitually crossing the legs while sitting can place excess pressure on the sciatic nerve. Sitting a lot can also place pressure on the sciatic nerves, so it's a good idea to take short breaks and move around during the work day, long trips, or any other situation that requires sitting for an extended length of time. If lifting is required, the back should be kept straight and the legs should provide the lift. Regular exercise, such as swimming and walking, can strengthen back muscles and improve posture. Exercise can also help maintain a healthy weight and lessen the likelihood of back strain. Douglas, Sara. "Sciatic Pain and Piriformis Syndrome." The Nurse Practitioner 22 (May 1997): 166. Disk — Dense tissue between the vertebrae that acts as a shock absorber and prevents damage to nerves and blood vessels along the spine. Electromyography — A medical test in which a nerve's ability to conduct an impulse is measured. Lumbosacral — Referring to the lower part of the backbone or spine. Myelography — A medical test in which a special dye is injected into a nerve to make it visible on an x ray. Piriformis — A muscle in the pelvic girdle that is closely associated with the sciatic nerve. Radiculopathy — A condition in which the spinal nerve root of a nerve has been injured or damaged. Spasm — Involuntary contraction of a muscle. Vertebrae — The component bones of the spine. neuralgia along the course of the sciatic nerve; the term is popularly used to describe a number of disorders directly or indirectly affecting the nerve. Because of its length, the sciatic nerve is exposed to many different kinds of injury, and inflammation of the nerve or injury to it causes pain that travels down from the back or thigh along its course through the lower limb into the foot and toes. Certain leg muscles may be partly or completely paralyzed by such a disorder. True sciatic neuritis is rare; it can be caused by a toxic substance such as lead or alcohol, and occasionally by other factors. Sciatic pain, however, can also be produced by conditions other than inflammation of the nerve. Probably the most common cause is a herniated disk. A back injury, irritation from arthritis of the spine, or pressure on the nerve from certain types of exertion may also be the cause. Occasionally diseases such as diabetes mellitus, gout, or vitamin deficiencies may be the inciting factor. In rare cases, pain may be referred over connected nerve pathways to the sciatic nerve from a disorder in another part of the body. Finally, some cases are idiopathic. Because of the long, painful, and disabling course of severe sciatica, the underlying cause should be investigated and corrected when possible. Radiation of sciatic nerve pain. From Frazier et al., 2000. Pain in the lower back and hip radiating down the back of the thigh into the leg, initially attributed to sciatic nerve dysfunction (hence the term), but now known to usually be due to herniated lumbar disk compressing a nerve root, most commonly the L5 or S1 root. /sci·at·i·ca/ (si-at´ĭ-kah) neuralgia along the course of the sciatic nerve, most often with pain radiating into the buttock and lower limb, most commonly due to herniation of a lumbar disk. 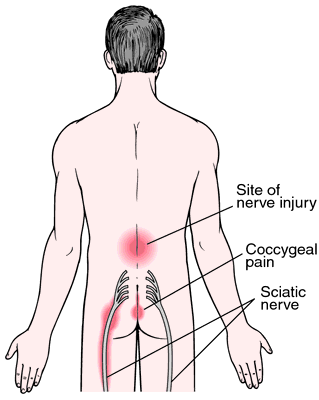 Distribution of pain in sciatica. Pain along the sciatic nerve usually caused by a herniated disk of the lumbar region of the spine and radiating to the buttocks and to the back of the thigh. an inflammation of the sciatic nerve, usually marked by pain and tenderness along the course of the nerve through the thigh and leg. It may result in a wasting of the muscles of the lower leg over time. Also called sciatic neuritis. Neurology Lumbosacral pain that radiates down the posterior thigh and lateral leg into the foot, caused by compression of the sciatic nerve and lumbosacral nerve roots Etiology Injury, prolapse of intervertebral disk, tumors, sciatic nerve irritation or inflammation Clinical Hyporeflexia, paresthesias, ↓ muscle strength. Cf Sciatic nerve dysfunction. Pain in the lower back and hip radiating down the back of the thigh into the leg, initially attributed to sciatic nerve dysfunction (hence the term), but now known to usually be due to herniated lumbar disc compromising the L5 or S1 root. Pain arising from abnormal stimulation of the SCIATIC NERVE, usually from pressure on the sciatic nerve roots from pulp material from an INTERVERTEBRAL DISC. The symptom varies from minor backache to severe pain extending down to the foot and associated with muscle weakness. The treatment is that of the cause. (Contugno), Domenico Felice Antonio, Italian anatomist, 1736-1822.
pain felt from the lower back to the buttock, and down the back of the leg to the outside of the foot, due to compression of the spinal nerve roots that form the sciatic nerve, aggravated by bending forwards - the 'slump test'. May cause detectable sensory loss and occasionally foot-drop. See also intervertebral disc. n inflammation or compression of the sciatic nerve; causes dull aches and tenderness or numbness to sharp or severe radiating pain through the buttock region and down the posterior of the thigh, sometimes to the foot. Pain in lower back and hip radiating down back of thigh into leg, due to herniated lumbar discs compressing a nerve root, most commonly L5 or S1. n an inflammation of the sciatic nerve, usually marked by pain and tenderness along the course of the nerve through the thigh and leg. Q. What are some of the best remedies for sciatica? tell me if you tried it! Dirk explains that it can be common for people with sciatica to also experience numbness and tingling/pins and needles that travel from the lower back and moves down one of your legs to your foot. An evaluation for sciatica includes taking a complete medical history, conducting a physical examination, and assessing neuromuscular function. 4] six sciatica patients with suspected piriformis syndrome underwent surgery to relieve pressure on the sciatic nerve. Patients of sciatica keep reporting to neuro-surgical department for both indoor and outdoor management. Manual therapy, posture and body mechanics training, strength and conditioning, and stress-reduction techniques are among the approaches used to treat sciatica. Danesh says, "but you also may experience sciatica if the bulging portion of the disc pinches or irritates the roots of the sciatic nerve. Sciatica is most frequently a symptom indicative of spinal disc herniation and seldom has an extraspinal aetiology . Awareness of these possible causes of non-discogenic sciatica and careful attention to the patient's history, physical examination, and paraclinical details can assist the physician in making the correct diagnosis and treatment. DISCUSSION: Lumbar epidural steroid injections are very effective in patients with acute lumbar discogenic pain with sciatica. Based on his age, history, physical exam, and MRI findings, the working diagnosis was a right-sided lumbosacral disc herniation with sciatica. Gerald Cooke has developed the non-slip Fidgety Foot Stool which he claims has led to a massive improvement in the sciatica he has suffered from for the last ten years.